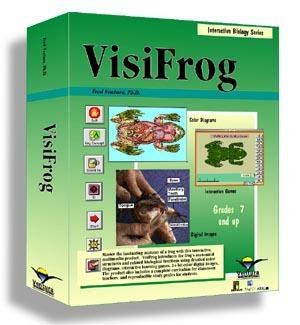 VisiFrog introduces the frog's anatomical structures and biological functions through computer graphics, digital images, sound, and textual information. It offers a comprehensive overview of vertebrate anatomy, covering: the external surface (dorsal), the musculature (dorsal and ventral), the skeleton, the heart and arteries, the venous, digestive, respiratory, nervous, and urogenital (male and female) systems. Colour diagrams allow students easy access to a complete description while exploring anatomical structures and functions. The ‘digital image’ option allows students to move from colour diagrams to images of an actual frog, while the quiz component reinforces terminology and skills in a challenging and fun game format.